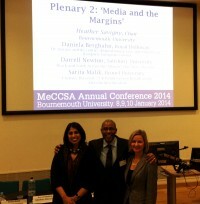 Daniela Berghahn and Sarita Malik gave keynote addresses at this year's MeCCSA conference (8-10 January 2014) at Bournemouth University. They were joined by Darrell Newton at a plenary that explored Media and the Margins, which was also the MeCCSA conference theme this year. Invoking Isaac Julien and Kobena Mercer's seminal essay 'De margin and de centre', Daniela Berghahn traced the repositioning of race and ethnicity in diasporic European cinema between the 1950s and the present. She argued that the growing tendency to use popular genres, notably comedies, gangster and war films, to dramatise the experience, history and memory of ethnic minorities has enhanced the cross-over appeal of diasporic films over the past fifteen years, leading to some remarkable box-office successes. However, the freedom to shed 'the burden of representation' and to make films about any subject is the ultimate proof of the gradual 'normalisation' of race and ethnicity. Examining the relationship between race and UK public service broadcasting policy, Sarita Malik argued that the concept of 'creative diversity' has recently superseded earlier policies on 'multiculturalism' and 'cultural diversity'. Creative diversity provides another incremental depoliticisation of race that enables the 'marketisation' of television and multiculture, and ultimately safeguards the interests of public service broadcasting. Darrell Newton's paper 'Black and forth across the Atlantic: One man's mission' charted the transatlantic trajectory (taking him from Salisbury University, Maryland, to London) of his own research on ethnic minority voices, notably Black Britons, in relation to the BBC's public broadcasting agenda. One of the many salient points of his presentation was that British, in contrast to American, television has no major Black stars, which Newton regarded as indicative of the continued marginalisation of race in UK's television landscape.